It is 1500 hours, and the Emergency Medical Services (EMS) in Anytown, USA, is busy. The local EMS System has just experienced a Mass Casualty Incident, or an “MCI.” One supervisor is on the scene with three ambulances that are transporting six patients from a motor vehicle collision. The second supervisor is waiting at the receiving hospital to assist the arriving crews with off-loading patients. Until recently, the above-mentioned scenario would have been the result of an abandonment of the usual response practices, and a multitude of resources and ambulances would have been dispatched to assist this MCI. The resulting chaos would have caused increased levels of frustration and confusion, and scene control would have been lost. The larger the MCI was, the greater the chaos. Leader/Task Force Leader position that has resulted in changes to the response protocols used on a daily basis. These changes in training help better accommodate an MCI without crippling the daily response system. In the aftermath of Rita and Katrina, many agencies across the country revisited their disaster plans. 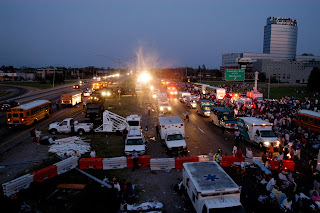 The dispatch and use of multiple EMS and ambulance resources in response to Rita/Katrina and the resulting chaos caused a review and revision of many of the disaster plans in place prior to these life-altering events. One of the Adjunct Instructors for TEEX, who taught in the Incident Management and EMS Leadership programs independently and concurrently, brought a California disaster management program to the attention of TEEX staff called the Ambulance Strike Team/Task Force Leader program. While the California program provided the essential elements for an Ambulance Strike Team Leader program, much of the material was determined to be too California-specific to be applied on a broader base. So, drawing on resources from many different areas, TEEX assembled a group of subject matter experts, many of whom had been directly involved in the Rita/Katrina experience. They then revised the Ambulance Strike Team Leader program. Reduced from 24 to 16 hours, the current program focuses on specific concepts of strike team leadership and how to operate within an Incident Command Structure across a whole host of disaster situations. class in accordance with ICS principles. This includes receiving assignments from the Incident Commander or Operations Section Leader, utilizing ICS forms, and interacting with ICS functions for all needs during the class. For example, if a team needs colored pens and sticky notes, they have to complete the correct ICS form and request these supplies from Logistics. The class is divided into eight operational periods. During each operational period, the role of Strike Team Leader is rotated among each member of the six-person team. Each operational period has functional exercises that build upon each other until the largest exercise at the end of operational period seven. In this last exercise, all the concepts come together, with each team working together to solve problems and issues as the strike teams work to perform a large-scale evacuation in advance of an oncoming disaster. Lastly, in operational period eight, the teams take a written test and then work through the demobilization process to return all class materials back to the instructors. The Ambulance Strike Team/Task Force Leader program will continue to provide critical analysis for success as it continues to evolve and as leaders gain valuable insights and experience they are willing to share. Training and preparation remain the two keys to mitigating the results of unexpected disasters that occur in our lives. 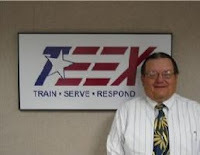 Forest "Woody" Wood is a training manager for the Texas Engineering Extension Service and the Coordinator for the EMS Leadership Academy. Photos 1 & 2 taken by FEMA photographer Jocelyn Augustino, San Antonio, Texas, Sept. 2008.